Debach is a small village about four miles northwest of Woodbridge, Suffolk, UK. At the time of the Domesday Book, 1086, it was called Debenbeis or Debeis, Depebecs, Debec or Debes and located in the Hundred of Wilford. The book lists the landowners there at that time as Count Alan, Roger Bigot - the Sheriff of Norfolk and Suffolk, and Sturstan son of Widdow and Roger de Poitou from him, The Bishop of Bayeux, William de Warenne, Geoffrey de Mandeville and Ranulph Peveril. There were 9.5 households in the village and the taxable value to the lord at that time was £0.2. The survey recorded that the village's resources included an acre of meadow, one church and 0.06 acres of church land. In 1066 Edric Grimm had been the overlord of Debach. 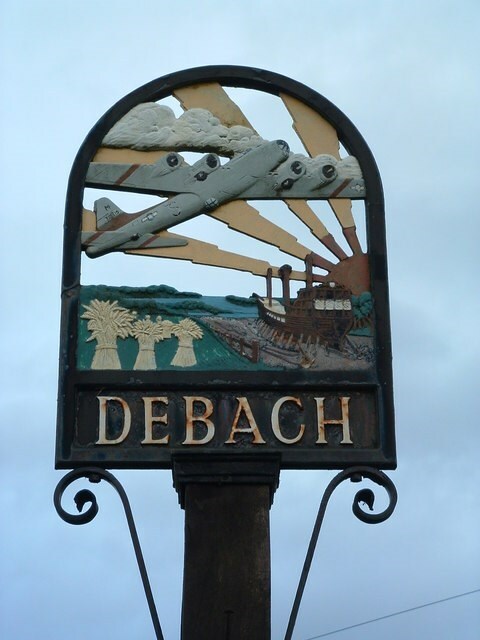 During World War II the village housed Royal Air Force Station Debach, RAF Debach, a bomber airfield which was transferred to the USAAF and became home to the 493rd BG(H) - Helton's Hellcats- USAAF. The airfield closed soon after the war and was used as a prisoner of war camp in 1945 for German prisoners. Part of the runway has been preserved.